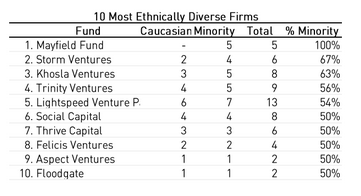 Chamath Palihapitiya, the opinionated venture capitalist who once got into a public spat with Ron Conway over income inequality and challenged founders to have the “courage to move to Oakland” a few weeks ago, has catalogued detailed racial and gender diversity data on venture firms throughout Silicon Valley in a report with the subscription technology news site, The Information. Palihapitiya said he was motivated to do this because if the big tech companies and startups like Slack start taking diversity more seriously, so should the firms and investors funding them. Indeed, the diversity conversation that started when Google finally divulged its own data in May 2014 after it and several other major technology companies including Apple, Oracle and Yahoo resisted publicly reporting it under federal law for many years, isn’t necessarily about numbers. It is a much more fundamental conversation about what the future of American society should look like and ​who​ should be shaping it. If a handful of predominantly white men is building or hand-picking the technology companies that touch hundreds of millions or billions of customers around the world, what defaults are embedded into these products and business models that further entrench inequity? It becomes a more pressing question as the technology industry moves from purely software-based companies toward businesses that touch and allocate finite resources in the real world like in labor, transit, land-use, real estate, health care and education — where equity is a major concern for public policy makers. 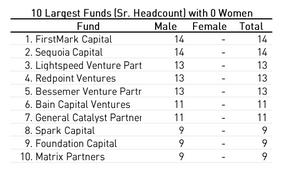 Social + Capital then calculated a quantitative ranking of all of the venture firms, based on their gender and racial diversity and split out by the total amount of assets under management. For firms with more than $1 billion in under management, Palihapitiya came out on top. For mid-size firms, Y Combinator came out in the top positions followed by Formation 8. For firms with less than $250 million under management, the top firm was Floodgate and then Cowboy Ventures. Social + Capital’s mathematical formula weighted racial diversity evenly between white, black, Latino and Asian people, and didn’t break out any special emphasis for underrepresented minorities. In general, white- and Asian-Americans are overrepresented in both large technology companies and in the venture world relative to their share of the U.S. population. The Social + Capital formula’s choice would be a complicated one either way, given the “Model Minority” narrative that clouds the story of Asian-American immigration. What does Palihapitiya want firms and the public to do with the data? It’s largely up to them, he said.